The lazy days of summer are almost behind us. As Labor Day approaches and kids return back to school we know that fall is just around the corner. Soon the temperatures will drop and the rainy season will be upon us. End of summer storms and the wet months ahead make this the perfect time to get your vehicle ready for driving in wet weather. 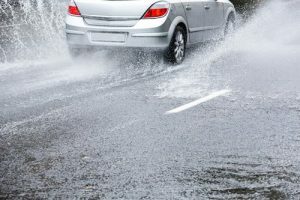 Here are a few recommendations from automotive experts to help you prepare your vehicle and stay safe during the rainy season. -Check windshield wiper blades: Months of hot weather can dry and wear down the rubber on wiper blades causing them to break down. If your windshield wipers leave streaks or skip when in use it is time to replace the blades. Also be sure to check the windshield washer solvent reservoir to make sure it is filled with washer fluid, not water. Windshield washer fluid is formulated to cut through oils that may get splashed up on the windshield and it usually contains a freeze protection agent. –Check headlights, taillights and brake lights: Reduced visibility is a safety hazard while driving in the rain. Check to make sure that your exterior lights not only work but are properly aimed. Also check to make sure that your windshield defroster works. Even though it may be months before we experience freezing temperatures, the defroster clears windshields of fog and moisture that can accumulate inside of the vehicle and cause impaired visibility. – Inspect your tires: Make sure that your tires are in good condition and are inflated to the manufacturer recommended tire pressure. Your tread should be at least 2/32 of an inch in depth at any two adjacent grooves. Try the penny test by placing a penny head first into several tread grooves across the tire. If the top of Lincoln’s head is always visible. your treads are shallow and worn. If Lincoln’s head is always covered by the tread your tires are probably fine. If you are not sure, please bring your vehicle in to our Honda service center and we will check your tire air pressure and tread for you. -Have your brakes checked: If your vehicle seems to take longer than necessary to stop or if you hear any unusual sounds when applying the brakes it is time for a brake inspection. Although the in dash brake light is set to alert you when service is needed, it is a good idea to have your brakes checked regularly. -Have a mechanic check any air filter modifications: When air filters or “fresh air intake systems” are modified to increase engine power vehicles may be at risk for taking rainwater into the engine when streets get flooded. Water ingested into the engine can lead to engine failure and expensive repairs. Our mechanics are happy to check your engine and make any necessary adjustments to keep it running perfectly, even in wet weather. Our Toyota Service center offers a variety of maintenance services to get your vehicle ready for the rainy season. Bring your vehicle in to our Rochester Toyota Dealership for a check up and be ready for the wet weather ahead.